Are engineering and management schools adequately preparing students for our fast-changing, highly complex business world? Not quite, say a number of recent studies. A good education should include soft as well as hard competencies. Universities generally do a pretty good job when it comes to teaching hard skills, - engineering methods, technology, analytical tools, finance, marketing, and so on. But they don’t do so well with the softer competencies, including communications, teamwork and systemic thinking. For example, a 2007 study on MBA education found significant gaps between the competencies companies are looking for, and what students are taught in business schools. Companies generally want MBA graduates with good social skills who are good at leadership, communications, and innovation. However, the students frequently complain that such skills will not get them the kinds of jobs they want, and they pressure the schools to offer them courses that are more functional, analytical and technical. This particular study focused primarily on MBA programs, but similar skill gaps are likely to be found in engineering and other STEM programs. Three years ago, USC’s Annenberg School of Communications and Journalism embarked on the Third Space, a research project to better understand the nature of the so-called soft competencies companies are looking for, as well as the talent requirements not being adequately addressed by engineering and business schools. The project’s initial findings were recently described in a working paper, The one-trillion dollar global talent gap: What it is and what we can do about it, by Ernest Wilson, Dean of the Annenberg School. In its first phase, the study conducted face-to-face, in-depth conversations with 75 senior executives across companies in a broad range of industries, including automobile, banking consulting, consumer products and technology. Online surveys were used to gather additional data. A number of academic institutions were consulted as well. “Innovation - identified by MIT economist and Nobel laureate Robert Solow as the driver of long-term, sustainable economic growth and prosperity - has been a hallmark of the Massachusetts Institute of Technology since its inception.” Thus starts The MIT Innovation Initiative: Sustaining and Extending a Legacy of Innovation, the preliminary report of a yearlong effort to define the innovation needed to address some of the world’s most challenging problems. Released earlier this month, the report was developed by the MIT Innovation Initiative, launched a year ago by MIT President Rafael Reif. I found the report quite interesting, both because I’ve been closely involved with innovation activities through a great part of my career, and because since 2005 I’ve been affiliated with MIT. Beyond MIT, the report should be of value to anyone interested in the growing importance of innovation to institutions, economies and societies around the world. A decade ago I was part of the National Innovation Initiative, a major effort convened by the Council on Competitiveness to develop a US innovation agenda. Its final report, - Innovate America: Thriving in a World of Challenge and Change, - was released in December of 2004. The report did an excellent job in explaining the role innovation plays in US competitiveness. It included more than 60 detailed recommendations in three major areas: talent, investment and infrastructure. Since then, technology has continued to make dramatic advances. But for a variety of reasons, job creation, entrepreneurship and US global competitiveness, - the key measures of a thriving innovation economy, - have not fared so well. A number of recent studies have observed that startup rates, - the nation’s job creative engine, - have been declining across the country, especially since 2000. And while US employment keeps improving, serious questions remain about the impact of the digital revolution on the job prospects and wages of a large fraction of the workforce. In addition, the US is now in 10th place in R&D investments as a percentage of GDP among OECD nations, - having fallen from 2nd place in 1992. Innovation remains a subject in need of serious attention, especially given the emergence of our highly complex and unpredictable digital economy. A good job has long been the foundation of the American Dream, - the possibility that anyone can get ahead and achieve prosperity through talent and hard work regardless of social class or circumstances of birth. But, the report warns that the American research enterprise, - and the American Dream, - are at a critical stage. 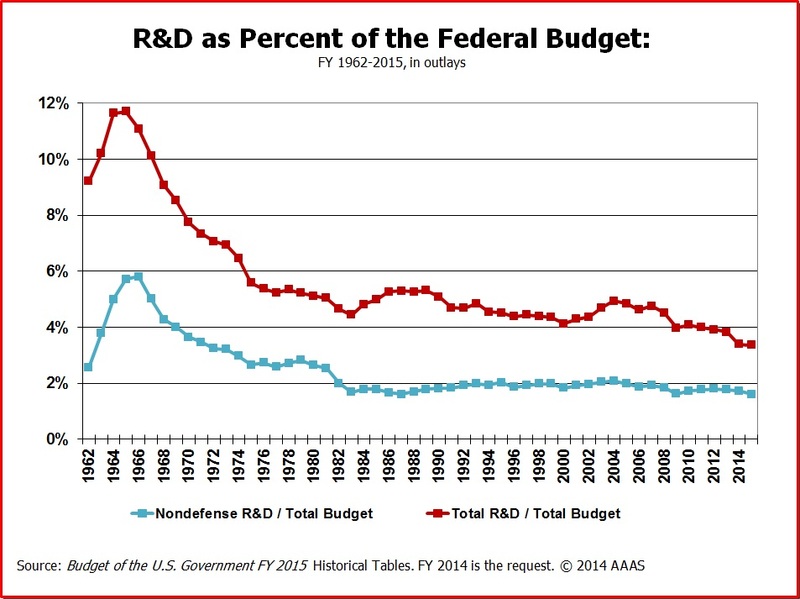 Federal support for basic research as a percentage of GDP has declined 13% over the past decade. In 1992, the US had the second highest R&D investments as a percentage of GDP among OECD nations. It has now fallen to 10th place. While the US is losing some of its competitive edge, emerging nations are increasing their research investments in order to stimulate economic growth. China is projected to outspend the US in R&D within the next 10 years.